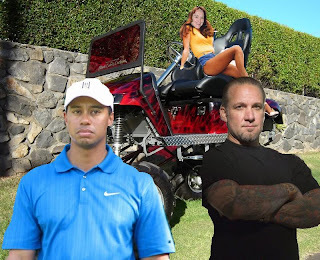 *Pictured (from left to right): Tiger Woods, MONSTER GOLF CART, my face, Catherine Bach's body, Jesse James. I know you have all been waiting for me to weigh in on the Tiger Woods/Jesse James scandals. Because, after all, I am a HUGE golf enthusiast and an even bigger monster car thingy building enthusiast. But most importantly, I am an enthusiast of unfaithfulness when it is done on the seat of a monster golf cart. Yes, I love to get it on with someone who isn't my boyfriend while riding along merrily on a golf cart that has been affixed with oversized wheels. Therefore, all of this Jesse James/Tiger Woods news and comparisons of the two excite me greatly. Of course, the opportunity to get sweaty parked on the fairway of the seventh hole straddling the seat of a diesel-powered golf cart with a pair of pincers that can be used to pick up stray golf balls with a guy who isn't my regular lover doesn't come along very often. So, I have to get it while I can. As you can imagine, when this Tiger Woods unfaithfulness thing happened, I was pretty much overjoyed. But then with the added bonus of Jesse James's cheating, well, I thought that all of my dreams had come true. Golf! Monster cars! Monster golf carts! Men who aren't my usual gentleman caller! Be still my slutty heart! So, the time has come at last for me, an expert in all things cheating while in the third seat of a stretch limo golf cart that can also be used to mow the fairway, to speak my peace on the matter of Tiger Woods and Jesse James cheating on their wives. And I guess I will just address them both on a personal level. Here goes. Jesse James, Tiger Woods? I'm no expert on sleeping with ordinary star fuckers. I like to broaden my horizons and sleep only with men who like it on monster golf carts and nowhere else. Particularly men who are not my current paramour. But when I do go out on the green late at night in my golf cart Transformer with laser putting technology, I do use one thing besides protection, and that thing is discretion. I don't want everyone to know how much I enjoy the combination of clandestine late-night meetings and golf carts with rotating gun turrets. Therefore, rather than sending poorly-spelled text messages to said late-night clandestine "meeting partners," I recommend driving directly through their living room walls to pick them up. That way, nobody gets hurt. Or just keeping it in your pants and not being a total dickface. We can't all be as careful at cheating as I am. I knew it was a mistake when we negotiated the deal for our top secret truck technology in exchange for protected property with your kind. All we wanted was to stay hidden away from prying eyes. We quickly realized that our oversized tires and suspensions would not stop your constant harassment with your photography. Sadly it's much worse now with Extra, TMZ, Perez Hilton and digital cameras. Many of us long for the days of John Tesh and pre-internet Entertainment Tonight. *I enjoy clandestinely impregnating inanimate objects behind middle schools.